Commnication Club flower sale. Et Cetera file photo. The Communication Club, two-time winner of Club of the Year and Fundraising of the Year at the OSER awards, remains one of the most active student groups on campus. 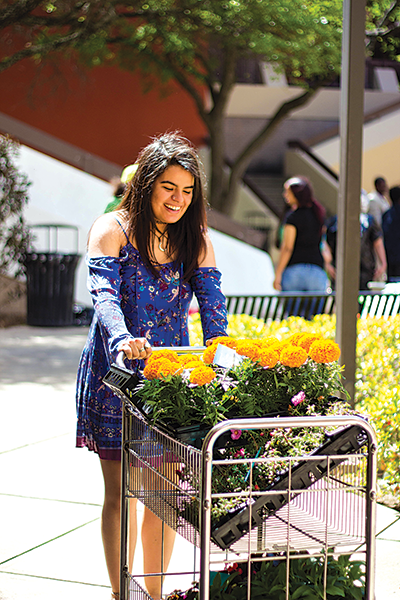 The club consistently has about 40 members and, new president Dylan Kinnard said the secret to the club’s success is creating a community environment where students feel welcome. He said the Communication Club does not force students to speak at a podium or give a specific number of speeches. Instead, the focus is on building life and leadership skills through community service, fundraising and attending socials. Students who join the club can earn one speech credit hour per semester and up to four transferrable credit hours total. The club has participated in volunteer activities such as planting trees, picking up trash and even helping to set up hot air balloons that take people on rides. Through fundraising, the club raises money to go on a yearly retreat to Sky Ranch, where members can build their leadership skills while also enjoying zip line rides and horseback riding. Communication Club fundraisers have included flower sales, bake sales and an event where people pay to shove a pie in someone’s face. Two pieces of advice that Kinnard has for students who want to start a club are to choose a topic that all members are passionate about and to have a good adviser that can support the team. Mary Forrest, the adviser of the Communication Club, is who Kinnard said encouraged him when he first became treasurer of the club. Michelle Salas, who still visits Forrest to help out on campus, was club president in 2009. She said when she joined the club 10 years ago, it was during a transitional period. Everyone was leaving and she was quickly promoted to president, having to restart the club from scratch. Aley Salcedo, who was president of the club from 2015 to 2017, said she was able to intern at the state capital, having her stay paid for because of the connections she made through the Communication Club. She said interpersonal communication at the club is more important than just giving speeches, and it is the system of accountability that makes the club function so well.